With the release this month (October 2002) of the latest installment of 18,812 images, the Mars Global Surveyor (MGS) Mars Orbiter Camera(MOC) passes another major milestone: more than 100,000 images have been validated and archived with the NASA Planetary Data System. 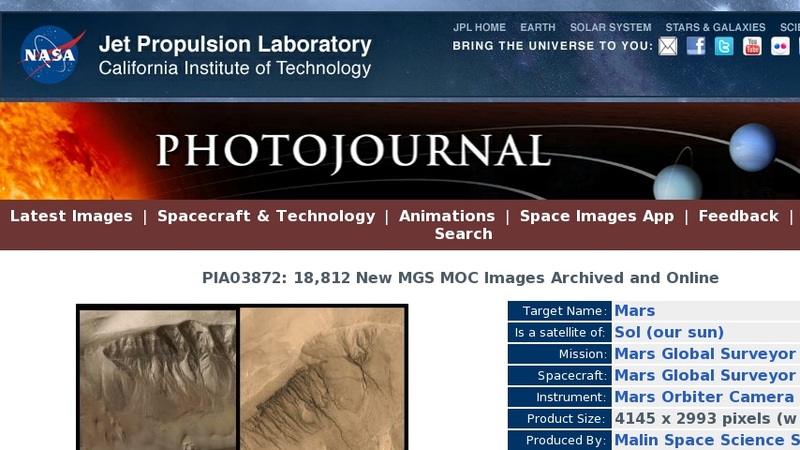 The total number of archived images now available on-line is 112,218--more than twice the number of pictures acquired by the two Viking orbiters in 1976-1980. These pictures, from MOC extended mission subphases E07 through E12, were acquired August 2001 through January 2002. Every six months, after a six-month, labor-intensive archiving effort, the MOC team releases six months-worth of validated data to the NASA Planetary Data System. Mars Global Surveyor is now in its sixth year orbiting the red planet. MGS reached Mars on 12 September 1997. The first MOC images were obtained on 15 September 1997. The two pictures shown here were taken by the MOC narrow angle (high resolution) camera and "colorized" by applying the colors of Mars obtained by the MOC wide angle cameras. Both pictures show gullies on the walls of two different meteor impact craters that occur in Newton Basin in Sirenum Terra, Mars. The picture on the left, showing gullies in a crater at 42.4S, 158.2W, exhibits patches of wintertime frost on the crater wall, and dark-toned sand dunes on the floor. The picture on the right, from a crater at 39.0S, 166.1W, is one of the highest-resolution images obtained from Mars. Its resolution is 1.5 meters (5 feet) per pixel--objects the size of school buses can be resolved in the full size image. The gullies in these craters originate at a specific layer and may have formed by release of groundwater to the martian surface in geologically recent times. MOC data from E07 through E12 include many exciting observations of the 2001 planet-enshrouding dust storm events, springtime retreat of the south polar seasonal frost cap, hundreds of images designed to monitor the retreat of carbon dioxide ice cliffs in the south polar residual cap, images obtained to look for changes and stereo views of gullies, pictures of proposed and potential Mars Exploration Rover landing sites, and more. Several previous MGS MOC releases highlighted these diverse E07-E12 observations: Malin Space Science Systems and the California Institute of Technology built the MOC using spare hardware from the Mars Observer mission. MSSS operates the camera from its facilities in San Diego, CA. The Jet Propulsion Laboratory's Mars Surveyor Operations Project operates the Mars Global Surveyor spacecraft with its industrial partner, Lockheed Martin Astronautics, from facilities in Pasadena, CA and Denver, CO.